One of the downsides, if it can be called that, about gardening is the obsession that can result from growing a single flower. For example, when I grew Zinnia ‘Green Envy’ I thought it would be the only Zinnia I would ever need. I quickly discovered that it would not be the case and every year I try a couple of new Zinnias, just to see. ‘Green Envy’ is still my first Zinnia love, but sometimes a gardener has to see what options are available to him. The problem arises when you try growing several cultivars and while planting them in the garden you discover that you forget which one is which. 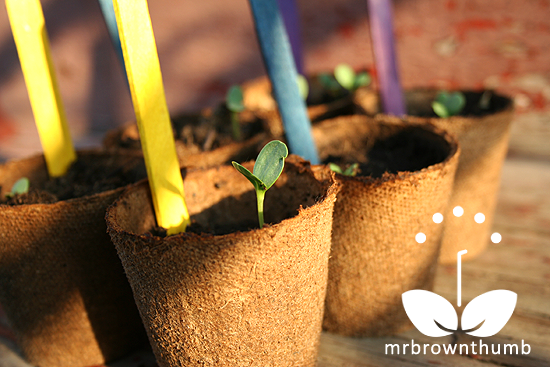 When plants are at the seedling stage, it can be rather difficult to tell them apart. I encountered this problem last year when I planned to sow seeds for Zinnia elegans “Green Envy,’ ‘Polar Bear and ‘California Giant.’ I did not want to create many homemade plant labels and spend an hour writing out the names. One afternoon while playing with the nephew it hit me: make color-coded plant labels and use them to keep track of the cultivars I was growing. My nephew had been making crafts using colored Popsicle sticks from the dollar store the day before I visited him and the moment I saw the Popsicle sticks I knew I had stumbled across the solution. One quick trip to the dollar store later and I had a stash of colored Popsicle sticks that I would use to create plant labels. 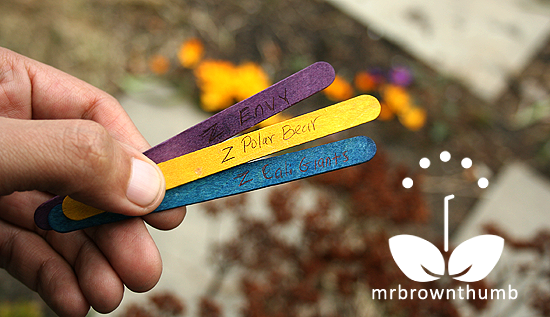 I assigned Zinnia ‘Polar Bear’ yellow, ‘Green Envy’ got purple and ‘California Giant’ ended up with the blue Popsicle sticks. I wrote the corresponding name on there colored Popsicle stick as a safety measure in case I forgot what color went with which plant and brought these three stick indoors and put them on my desk. Planting out the seedlings was easy because I only had to refer to the colors; no need to check the name on the label to make sure the seedlings were going in the spot they were suppose to. In addition, I could enlist the help of kids and just tell them to plant all the yellows here, the blues there and the greens over there. It was easy and created the color effect I was looking for. 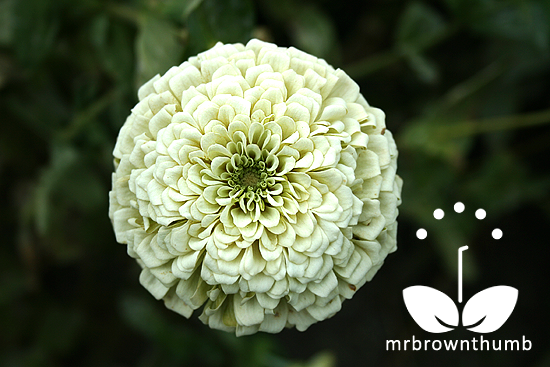 Here is a picture of Zinnia elegans ‘Polar Bear,’ as you probably guessed from the name it is a white blooming Zinnia. The seeds came from Renee’s Garden and I liked this Zinnia so much that I will have to grow it again sometime soon. A lovely white flower would look fantastic in a moon garden, or mixed in with darker colored blooms. This white zinnia looked great near my black tulips. If you are planning to make a lot of plant labels for all of your seed starting pots, go the color-coded plant label route if possible. Homemade colored plant labels make arranging seedlings in the garden a lot easier because you don’t have to bend down to read plant labels to identify which are which in the garden. I like this method so much that I started using it for all the seeds I was starting last year and will be using it this year again. I grew Green Envy several years ago and it was beautiful. This year I am growing some Zahara doubles and Highlight. With the heat of last summer zinnias were one of the best as far as survival. Great idea about the colored sticks. I love, love, love that zinnia! I'm going to orders some right now! I also have a stash of popsicle sticks I use with all my veggie starts - they work great! You're so right. It's difficult for me to find all of my plants at once, since they are all just labeled with a sharpie on the cup. You've inspired me! Ramon, what a cool idea! Plus it looks neat. I have tried using Popsicle sticks, but when they are constantly damp they get moldy. Or is that just the plain kind? Someone above mentioned plastic spoons. I suppose that could also do the trick. @Mary, Feel free to steal it. :0) Good luck with tracking your tomatoes! @Gatsbys Gardens, I'll have to try some of those, don't think I've ever given those a shot. @Angela, Hope you got some and that you get some huge blooms out of them. They're really striking when they grow to their full potential. @Mud, Yes, plastic spoons work well for plant markings. @Garden Hoard, HAHA, Glad you liked the tip. @Nellie, Thanks to you and Renee for the seeds. @Anonymous, If you have a problem with mold that's usually sign of too much moisture and not enough air circulation. But yes, the plastic I guess would work too.